Cerebral venous air embolism (CVAE) is an extremely rare phenomenon. Most reports of cerebral air embolism focus on the arterial territory, and consequently CVAE has remained poorly understood, especially regarding its pathophysiology and treatment. The authors describe an elderly male patient who was admitted through the Emergency Department with subacute confusion. 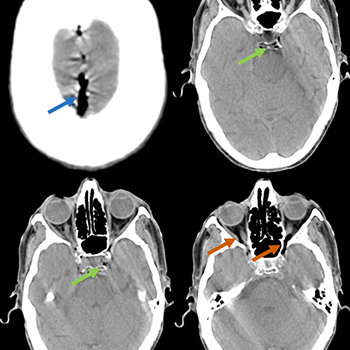 A brain computed tomography (CT) showed multiple cerebral venous gas emboli. No potential causes were found apart from previous peripheral vein cannulation and intravenous medication administration. The patient received supportive treatment, with complete radiological resolution of the gas emboli, while maintaining his previous confusional state. The aim of this report is to highlight a rare and understudied entity, and discuss its causes, proposed pathophysiology and appropriate management. Muth CM, Shank ES. Gas embolism. New Engl J Med 2000;342:476–482. McCarthy C, Behravesh S, Naidu S, Oklu R. Air embolism: practical tips for prevention and treatment. J Clin Med 2016;5:93. Schlimp CJ, Bothman PA, Brodbeck AE. Cerebral venous air embolism: what is it and do we know how to deal with it properly? JAMA Neurol 2014;71:243. Fracasso T, Karger B, Schmidt PF, Reinbold WD, Pfeiffer H. Retrograde venous cerebral air embolism from disconnected central venous catheter: an experimental model. J Forensic Sci 2010;56:101–104.